Few things inspire your average do-it-yourselfer more than the thought of remodeling the exterior of his or her home with a brand new coat of paint. Most experienced painters know the basics of applying paint to wood. 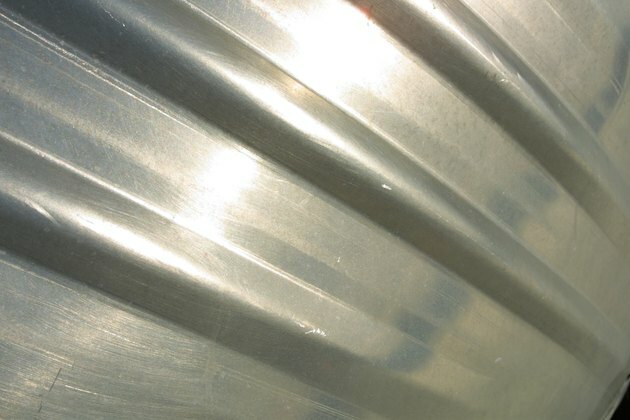 However, when it comes to painting metallic surfaces like aluminum flashing, there are a few preparation techniques you need to know to make sure the finish will hold up over time. Clean dirt, dust and cobwebs from the aluminum flashing using the pressure washer. Use the metal putty knife to remove any peeling or loose paint from the surface of the aluminum flashing. Skip this step if the aluminum flashing is unpainted. Use a wire brush to abrade the surface to promote paint adhesion. Do this by scratching the wire brush against the aluminum flashing in a circular, counter-clockwise motion. Cover all areas you do not want painted with blue painter's tape. Pour latex primer into the painter's pale or 5-gallon bucket. Fill it only about half-way. Apply primer to the aluminum flashing using the 3- to 4-inch paintbrush. Allow the primer to dry for about an hour or two. Repeat steps 5 and 6, except use paint instead of primer.